PopCap: The iPad "Will Change Gaming"
The cofounder of casual games giant, PopCap, said that in three years, the iPad "will change gaming." The iPad was introduced by Steve Jobs on January 27th, and most of the world responded with a collective exhalation, "Meh." Gamers seemed especially disappointed in the device, which won't support multitasking or even Flash games. Executives in the industry sounded off that they were either unimpressed or that the iPad might drive customers to purchase their own mobile gaming products. But not John Vechey. The cofounder of PopCap said that the iPad would have a huge impact on how we play games going forward. Here's this new device that gets to more people with a really great e-commerce model attached to it. It's really easy to buy on the iPhone - that's part of what makes it successful. This is my opinion and I think it's going to be phenomenally successful. I really do. It's very simple; it's not like it has a magical set of features, just a great package. I know what I'm getting when I have to get my mum a computer now: an iPad. Because she can't screw it up, she can't download a bunch of stuff... That's the perfect mum computer, right? And it's the perfect computer for ten year-olds to play with. 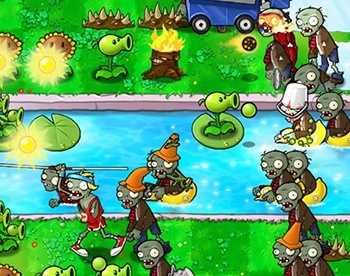 Vechey didn't have any specifics on PopCap's plans to port games to the iPad other than, "I don't know if this is a PopCap position or my word, but we're certainly going to support it - I want to play Plants vs Zombies on that," he said. "It feels good to touch, right?" Then interestingly, Vechey mentioned a genre which seems outside of PopCap's wheelhouse. "The iPad would be perfect for real-time strategy," he said. "You can't have this really immersive gaming experience but it may actually be more fun than a lot of different game experiences you can get with a PC or console." While discussing how their iPod games would be different on the new device, Vechey let slip a very true statement. "You know, we're still trying to figure that out," said Vechey. "It is a different thing but it's not that different." Yeah, that's what the rest of us are thinking. In all honesty, the iPad probably isn't as bad as we make it out to be and it may even change the way part of the population plays games the way that Vechey is predicting. But we're just not as excited as he is. "We're excited," he said. "The iPad's going to be awesome."